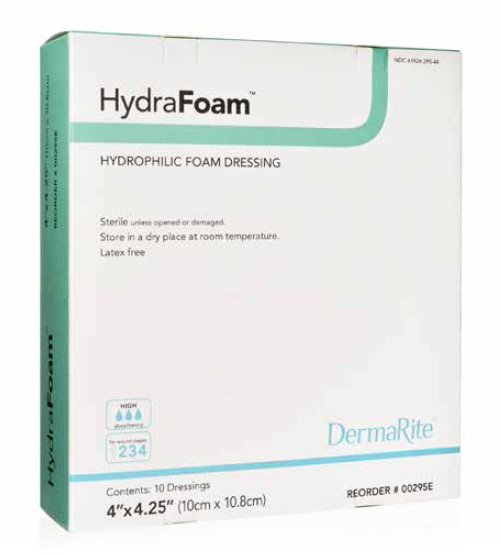 HydraFoam Hydrophilic Foam Dressing is a sterile, Hydrophilic (water-loving), highly absorbent foam wound dressing. It maintains a moist wound environment and prevents bacterial contamination. The foam dressing also wicks wound exudate to reduce risk for maceration of moderate to heavily draining wounds. The Hydrophilic foam dressing can absorb up to 20 times its own weight, and easily conforms to awkward-to-dress areas, providing protection and cushioning the wound. 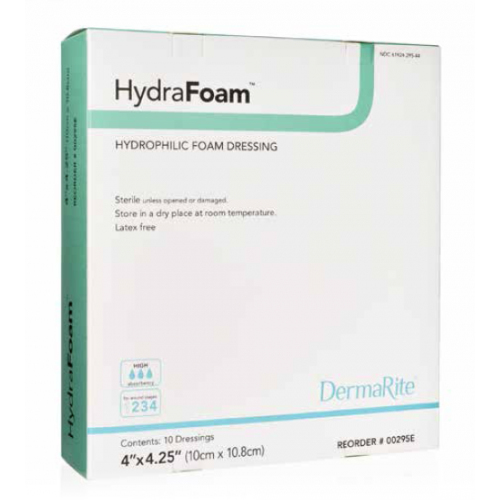 HydraFoam is a non-adhesive dressing, and so can be easily removed without causing skin trauma. In addition, the foam dressing can be cut to size to support moist wound healing of irregularly shaped wounds. This foam dressing supports moist wound healing and autolytic debridement. It provides excellent exudate management to minimize maceration, and it supports normalization of the wound bed temperature. The absorption, support and cushioning of the dressing help manage hypergranulation tissue. This wound dressing is latex free and is packaged for convenience in boxes of 10. It wicks wound exudate to reduce risk for maceration of moderate to heavily draining wounds. It can absorb up to 20 times its own weight. It easily conforms to awkward-to-dress areas. It provides protection and cushion for the wound. It supports normalization of wound bed temperature. The HydraFoam Dressing is a very absorbent dressing that help to maintain a moist wound to promote healing. My wife does much better on this dressing for her chronic ulcers. Good dressing sizes to choose from at 2, 4 or 6 inches square so that you can get the size you need according to the wound size. We have found that this dressing also helps to keep the wound from expanding in size.